I’d be lying if I said I didn’t read any baby-related books, though not as many as one might think: while taking cover in the trenches, one hardly has the time to pore over Sun Tzu’s The Art of War. Ezzo and Bucknam’s On Becoming Baby Wise: Giving Your Infant the Gift of Nighttime Sleep was read at breakneck pace over two sleepless nights. Rapley and Murkett’s Baby-Led Weaning was skimmed through when two front teeth made their menacing appearance earlier than expected. Anne Lamott’s Operating Instructions: A Journal of My Son’s First Year was a pleasant break from practicality, and documented with admirable accuracy the beautiful mess of first-time parenthood. Indonesian and Indonesia-related books, as always, made up a large portion of my reading list. Maria Dermoût’s The Ten Thousand Things made me melancholic about parenthood, while Ayu Utami’s Cerita Cinta Enrico [Enrico’s Love Story] made me pensive about childhood and adolescence. Laksmi Pamuntjak’s Aruna dan Lidahnya [Aruna and Her Palate] served up a buoyant yet substantial paean to Indonesia’s cuisine and indictment of its healthcare system that could rival any soufflé. I re-read Eka Kurniawan’s Lelaki Harimau and finally read Cantik Itu Luka in anticipation of their English translations, Man Tiger and Beauty is a Wound, which I also read. In hindsight, I wonder if I should have read the translations first: it is difficult to fully immerse oneself in a translation when haunted by the ghost of the original—and the ghosts of these novels are powerful ones. 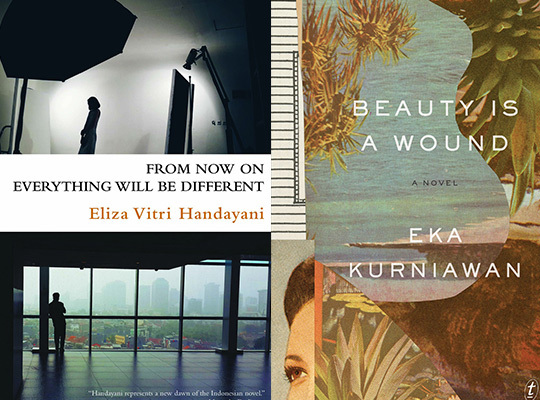 Last but not least, I rounded off the year with From Now On Everything Will Different by Eliza Vitri Handayani. And I think its starry-yet-sober-eyed vigor will stay with me well into 2016. Tiffany Tsao is Asymptote’s editor-at-large for Indonesia. Her fiction and poetry have appeared in Transnational Literature, Lontar, and the collection Contemporary Asian-Australian Poets (Puncher & Wattmann, 2013). She holds a PhD in English from UC Berkeley. Her first novel, The Oddfits (Amazon Crossing), will be out on Feb 1, 2016.